News and reviews site Technobuffalo said the design was an "egregious clone" that was "nearly impossible to distinguish" from the iPhone X. Tech news site The Verge pointed out that Google's image recognition algorithms described photos of the P30 as "iPhone". 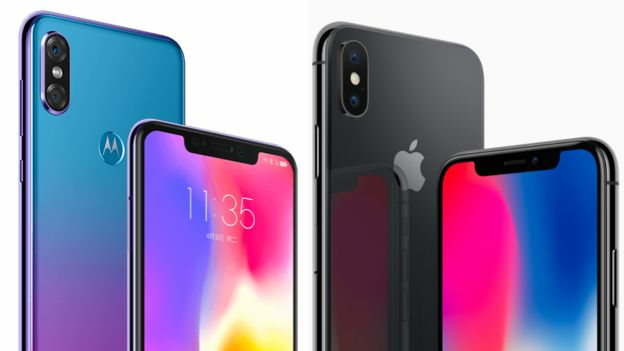 "The growing number of identikit smartphone designs is a depressing trend and it's little wonder consumer apathy is on the rise and replacement rates are slowing," said analyst Ben Wood from the CCS Insight consultancy. "One starts to wonder whether Jony Ive's design group at Apple has become the de facto owner for the reference design for all high-end smartphones. "Phone makers need to innovate and find ways to differentiate if they want to maintain consumer desire to upgrade their phones," he told the BBC. Lenovo plans to sell the Motorola P30 in China, but has not announced its availability in other countries. The device is expected to cost about $350 (£275) - less than half the price of Apple's flagship device.